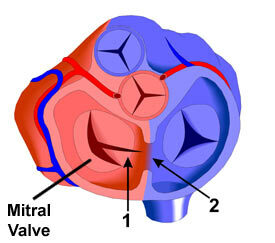 1) A malformation of the Mitral Valve (1 in diagram), the one-way valve between the left atrium and the left ventricle, or main pumping chamber of the heart. This consists of a cleft or notch in the "flaps" or leaflets of the valve, preventing complete separation of the left ventricle from the left atrium. 2) An Atrial Septal Defect (ASD), or hole in the septum (muscle wall) that separates the right and left upper chambers of the heart (atria). In partial atrioventricular septal defect, the atrial septal defect forms in the lower part of the atrial septum, which is known as an ostium primum type defect. Down Syndrome individuals comprise a smaller percentage of patients with partial atrioventricular septal defect than for the complete form of this defect.